In 2011, Monmouth Council Boy Scout Troop 150 produced four young men who achieved the rank of Eagle Scout. Only about 5 percent of all Boy Scouts earn this rank. would be pleased if you would join us from 4 to 7 p.m., Saturday, June 16, at St. Robert’s Parish Hall, 61 Georgia Road, Freehold Township, for a ceremony honoring our sons. Dinner will follow the ceremony. Your hosts are Chas and Chris Easton, Jim and Diane Jones, Geoff Larkin and Gretchen Van Benthuysen, and Dan and Barbara Nagle. Please let us know if you will attend and the number of people in your party by Saturday, June 2, by e-mailing cceaston@optonline.net or calling 732-938-2118. 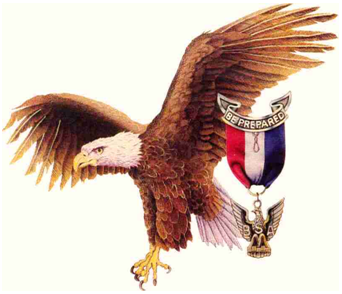 Past Eagle Scouts include Neil Armstrong, the first man to walk on the moon; home run king Hank Aaron; pro basketball player and U.S. State Senator Bill Bradley; President Gerald Ford; H. Ross Perot, self-made billionaire and presidential candidate; filmmaker Michael Moore; Donald Rumsfeld, secretary of defense; movie producer Steven Spielberg, and Sam Walton, founder of Wal-Mart. More famous Eagle Scouts.